Scheme of a liposome formed by phospholipids in an aqueous solution. Liposomes are composite structures made of phospholipids and may contain small amounts of other molecules. Though liposomes can vary in size from low micrometer range to tens of micrometers, unilamellar liposomes, as pictured here, are typically in the lower size range with various targeting ligands attached to their surface allowing for their surface-attachment and accumulation in pathological areas for treatment of disease. A liposome is a spherical vesicle having at least one lipid bilayer. The liposome can be used as a vehicle for administration of nutrients and pharmaceutical drugs. Liposomes can be prepared by disrupting biological membranes (such as by sonication). Liposomes are most often composed of phospholipids, especially phosphatidylcholine, but may also include other lipids, such as egg phosphatidylethanolamine, so long as they are compatible with lipid bilayer structure. A liposome design may employ surface ligands for attaching to unhealthy tissue. The major types of liposomes are the multilamellar vesicle (MLV, with several lamellar phase lipid bilayers), the small unilamellar liposome vesicle (SUV, with one lipid bilayer), the large unilamellar vesicle (LUV), and the cochleate vesicle. A less desirable form are multivesicular liposomes in which one vesicle contains one or more smaller vesicles. Liposomes should not be confused with lysosomes, or with micelles and reverse micelles composed of monolayers. The word liposome derives from two Greek words: lipo ("fat") and soma ("body"); it is so named because its composition is primarily of phospholipid. Liposomes were first described by British haematologist Alec D Bangham in 1961 (published 1964), at the Babraham Institute, in Cambridge. They were discovered when Bangham and R. W. Horne were testing the institute's new electron microscope by adding negative stain to dry phospholipids. The resemblance to the plasmalemma was obvious, and the microscope pictures served as the first evidence for the cell membrane being a bilayer lipid structure. Their integrity as a closed, bilayer structure, that could release its contents after detergent treatment (structure-linked latency) was established by Bangham, Standish and Weissmann in the next year. Weissmann - during a Cambridge pub discussion with Bangham - first named the structures "liposomes" after the lysosome, which his laboratory had been studying: a simple organelle the structure-linked latency of which could be disrupted by detergents and streptolysins. Liposomes can be easily distinguished from micelles and hexagonal lipid phases by negative staining transmission electron microscopy. Alec Douglas Bangham with colleagues Jeff Watkins and Malcolm Standish wrote the 1965 paper that effectively launched the liposome “industry”. Around this time he was joined at Babraham by Gerald Weissmann, an American physician with an interest in lysosomes. Now an emeritus professor at New York University School of Medicine, Weissmann recalls the two of them sitting in a Cambridge pub and reflecting on the role of lipid sheets in separating the interior of the cell from the exterior milieu. This insight, they felt, was to cell function what the discovery of the double helix had been to genetics. Bangham had called his lipid structures “multilamellar smectic mesophases” or sometimes “Banghasomes”. It was Weissmann who proposed the more user-friendly term liposome. A liposome has an aqueous solution core surrounded by a hydrophobic membrane, in the form of a lipid bilayer; hydrophilic solutes dissolved in the core cannot readily pass through the bilayer. Hydrophobic chemicals associate with the bilayer. 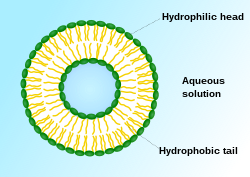 A liposome can be hence loaded with hydrophobic and/or hydrophilic molecules. To deliver the molecules to a site of action, the lipid bilayer can fuse with other bilayers such as the cell membrane, thus delivering the liposome contents; this is a complex and non-spontaneous event, however. By preparing liposomes in a solution of DNA or drugs (which would normally be unable to diffuse through the membrane) they can be (indiscriminately) delivered past the lipid bilayer, but are then typically distributed non-homogeneously. Liposomes are used as models for artificial cells. Liposomes can also be designed to deliver drugs in other ways. Liposomes that contain low (or high) pH can be constructed such that dissolved aqueous drugs will be charged in solution (i.e., the pH is outside the drug's pI range). As the pH naturally neutralizes within the liposome (protons can pass through some membranes), the drug will also be neutralized, allowing it to freely pass through a membrane. These liposomes work to deliver drug by diffusion rather than by direct cell fusion. A similar approach can be exploited in the biodetoxification of drugs by injecting empty liposomes with a transmembrane pH gradient. In this case the vesicles act as sinks to scavenge the drug in the blood circulation and prevent its toxic effect. Another strategy for liposome drug delivery is to target endocytosis events. Liposomes can be made in a particular size range that makes them viable targets for natural macrophage phagocytosis. These liposomes may be digested while in the macrophage's phagosome, thus releasing its drug. Liposomes can also be decorated with opsonins and ligands to activate endocytosis in other cell types. The use of liposomes for transformation or transfection of DNA into a host cell is known as lipofection. In addition to gene and drug delivery applications, liposomes can be used as carriers for the delivery of dyes to textiles, pesticides to plants, enzymes and nutritional supplements to foods, and cosmetics to the skin. Regarding the use of liposomes as a carrier of dietary and nutritional supplements; until very recently the use of liposomes were primarily directed at targeted drug delivery. However, the versatile abilities of liposomes are now being discovered in other settings. Liposomes are presently being implemented for the specific oral delivery of certain dietary and nutritional supplements. A very small number of dietary and nutritional supplement companies are currently pioneering the benefits of this unique science towards this new application. This new direction and employment of liposome science is in part due to the low absorption and bioavailability rates of traditional oral dietary and nutritional tablets and capsules. The low oral bioavailability and absorption of many nutrients is clinically well documented. Therefore, the natural encapsulation of lypophilic and hydrophilic nutrients within liposomes has made for a very effective method of bypassing the destructive elements of the gastric system and aiding the encapsulated nutrient to be delivered to the cells and tissues. It is important to note that certain influential factors have far-reaching effects on the percentage of liposome that are yielded in manufacturing. These influences also have an effect on the actual amount of realized liposome entrapment and the actual quality of the liposomes themselves. These are very crucial elements which lead to the long term stability of the liposomes. These complex yet significant factors are the following: (1) The actual manufacturing method and preparation of the liposomes themselves; (2) The constitution, quality, and type of raw phospholipid used in the formulation and manufacturing of the liposomes; (3) The ability to create homogeneous liposome particle sizes that are stable and hold their encapsulated payload. These primary and key elements comprise the foundation of an effective liposome carrier for use in increasing the bioavailability of oral dosages of dietary and nutritional supplements. Useful liposomes rarely form spontaneously. They typically form after supplying enough energy to a dispersion of (phospho)lipids in a polar solvent, such as water, to break down multilamellar aggregates into oligo- or unilamellar bilayer vesicles. Liposomes can hence be created by sonicating a dispersion of amphipatic lipids, such as phospholipids, in water. Low shear rates create multilamellar liposomes. The original aggregates, which have many layers like an onion, thereby form progressively smaller and finally unilamellar liposomes (which are often unstable, owing to their small size and the sonication-created defects). Sonication is generally considered a "gross" method of preparation as it can damage the structure of the drug to be encapsulated. Newer methods such as extrusion and Mozafari method  are employed to produce materials for human use. Using lipids other than phosphatidylcholine can greatly facilitate liposome preparation. Further advances in liposome research have been able to allow liposomes to avoid detection by the body's immune system, specifically, the cells of reticuloendothelial system (RES). These liposomes are known as "stealth liposomes". They were first proposed by G. Cevc and G. Blume and, independently and soon thereafter, the groups of L. Huang and V. Torchilin and are constructed with PEG (Polyethylene Glycol) studding the outside of the membrane. The PEG coating, which is inert in the body, allows for longer circulatory life for the drug delivery mechanism. However, research currently seeks to investigate at what amount of PEG coating the PEG actually hinders binding of the liposome to the delivery site. In addition to a PEG coating, most stealth liposomes also have some sort of biological species attached as a ligand to the liposome, to enable binding via a specific expression on the targeted drug delivery site. These targeting ligands could be monoclonal antibodies (making an immunoliposome), vitamins, or specific antigens, but must be accessible. Targeted liposomes can target nearly any cell type in the body and deliver drugs that would otherwise be systemically delivered. Naturally toxic drugs can be much less systemically toxic if delivered only to diseased tissues. Polymersomes, morphologically related to liposomes, can also be used this way. Also morphologically related to liposomes are highly deformable vesicles, designed for non-invasive transdermal material delivery, known as Transfersomes. Certain anticancer drugs such as doxorubicin (Doxil) and daunorubicin may be administered via liposomes. Liposomal cisplatin has received orphan drug designation for pancreatic cancer from EMEA. A study published in May 2018 also explored the potential use of liposomes as "nano-carriers" of fertilizing nutrients to treat malnourished or sickly plants. Results showed that these synthetic particles "soak into plant leaves more easily than naked nutrients," further validating the utilization of nanotechnology to increase crop yields. ^ a b Torchilin, V (2006). "Multifunctional nanocarriers". Advanced Drug Delivery Reviews. 58 (14): 1532–55. doi:10.1016/j.addr.2006.09.009. PMID 17092599. ^ a b c Cevc, G (1993). "Rational design of new product candidates: the next generation of highly deformable bilayer vesicles for noninvasive, targeted therapy". Journal of Controlled Release. 160 (2): 135–146. doi:10.1016/j.jconrel.2012.01.005. PMID 22266051. ^ Bangham, A. D.; Horne, R. W. (1964). "Negative Staining of Phospholipids and Their Structural Modification by Surface-Active Agents As Observed in the Electron Microscope". Journal of Molecular Biology. 8 (5): 660–668. doi:10.1016/S0022-2836(64)80115-7. PMID 14187392. ^ Horne, R. W.; Bangham, A. D.; Whittaker, V. P. (1963). "Negatively Stained Lipoprotein Membranes". Nature. 200 (4913): 1340. Bibcode:1963Natur.200.1340H. doi:10.1038/2001340a0. PMID 14098499. ^ Bangham, A. D.; Horne, R. W.; Glauert, A. M.; Dingle, J. T.; Lucy, J. A. (1962). "Action of saponin on biological cell membranes". Nature. 196 (4858): 952–955. Bibcode:1962Natur.196..952B. doi:10.1038/196952a0. PMID 13966357. ^ Bangham A.D.; Standish M.M. ; Weissmann G. (1965). "The action of steroids and streptolysin S on the permeability of phospholipid structures to cations". J. Molecular Biol. 13: 253–259. doi:10.1016/s0022-2836(65)80094-8. ^ Sessa G.; Weissmann G. (1970). "Incorporation of lysozyme into liposomes: A model for structure-linked latency". J. Biol. Chem. 245: 3295–3301. ^ YashRoy R.C. (1990). "Lamellar dispersion and phase separation of chloroplast membrane lipids by negative staining electron microscopy" (PDF). Journal of Biosciences. 15 (2): 93–98. doi:10.1007/bf02703373. ^ Weissmann G.; Sessa G.; Standish M.; Bangham A. D. (1965). "ABSTRACTS". J. Clin. Invest. 44 (6): 1109–1116. doi:10.1172/jci105203. ^ Geoff Watts (2010-06-12). "Alec Douglas Bangham". The Lancet. 375 (9731): 2070. doi:10.1016/S0140-6736(10)60950-6. Retrieved 2014-10-01. ^ Cevc, G; Richardsen, H (1993). "Lipid vesicles and membrane fusion". Advanced Drug Delivery Reviews. 38 (3): 207–232. doi:10.1016/s0169-409x(99)00030-7. PMID 10837758. ^ a b Barenholz, Y; G, Cevc (2000). Physical chemistry of biological surfaces, Chapter 7: Structure and properties of membranes. New York: Marcel Dekker. pp. 171–241. ^ Bertrand, Nicolas; Bouvet, CéLine; Moreau, Pierre; Leroux, Jean-Christophe (2010). "Transmembrane pH-Gradient Liposomes to Treat Cardiovascular Drug Intoxication". ACS Nano. 4 (12): 7552–8. doi:10.1021/nn101924a. PMID 21067150. ^ Barani, H; Montazer, M (2008). "A review on applications of liposomes in textile processing". Journal of Liposome Research. 18 (3): 249–62. doi:10.1080/08982100802354665. PMID 18770074. ^ Meure, LA; Knott, R; Foster, NR; Dehghani, F (2009). "The depressurization of an expanded solution into aqueous media for the bulk production of liposomes". Langmuir : The ACS Journal of Surfaces and Colloids. 25 (1): 326–37. doi:10.1021/la802511a. PMID 19072018. ^ Yoko Shojia; Hideki Nakashima (2004). "Nutraceutics and Delivery Systems". Journal of Drug Targeting. ^ Williamson, G; Manach, C (2005). "Bioavailability and bioefficacy of polyphenols in humans. II. Review of 93 intervention studies". The American Journal of Clinical Nutrition. 81 (1 Suppl): 243S–255S. doi:10.1093/ajcn/81.1.243S. PMID 15640487. ^ Bender, David A. (2003). Nutritional Biochemistry of Vitamins. Cambridge, U.K.
^ Szoka Jr, F; Papahadjopoulos, D (1980). "Comparative properties and methods of preparation of lipid vesicles (liposomes)". Annual Review of Biophysics and Bioengineering. 9: 467–508. doi:10.1146/annurev.bb.09.060180.002343. PMID 6994593. ^ Chaize, B; Colletier, JP; Winterhalter, M; Fournier, D (2004). "Encapsulation of enzymes in liposomes: High encapsulation efficiency and control of substrate permeability". Artificial Cells, Blood Substitutes, and Immobilization Biotechnology. 32 (1): 67–75. doi:10.1081/BIO-120028669. PMID 15027802. ^ Gomezhens, A; Fernandezromero, J (2006). "Analytical methods for the control of liposomal delivery systems". TrAC Trends in Analytical Chemistry. 25 (2): 167–178. doi:10.1016/j.trac.2005.07.006. ^ Mozafari, MR; Johnson, C; Hatziantoniou, S; Demetzos, C (2008). "Nanoliposomes and their applications in food nanotechnology". Journal of Liposome Research. 18 (4): 309–27. doi:10.1080/08982100802465941. PMID 18951288. ^ Colas, JC; Shi, W; Rao, VS; Omri, A; Mozafari, MR; Singh, H (2007). "Microscopical investigations of nisin-loaded nanoliposomes prepared by Mozafari method and their bacterial targeting". Micron (Oxford, England : 1993). 38 (8): 841–7. doi:10.1016/j.micron.2007.06.013. PMID 17689087. ^ Blume, G; Cevc, G (1990). "Liposomes for the sustained drug release in vivo". Biochimica et Biophysica Acta. 1029 (1): 92–97. doi:10.1016/0005-2736(90)90440-y. ^ Klibanov, AL; Maruyama, K; Torchilin, VP; Huang, L (1990). "Amphipathic polyethyleneglycols effectively prolong the circulation time of liposomes". FEBS Letters. 268 (1): 235–237. doi:10.1016/0014-5793(90)81016-h.
^ Blume, G; Cevc, G; Crommelin, M D A J; Bakker-Woudenberg, I A J M; Kluft, C; Storm, G (1993). "Specific targeting with poly (ethylene glycol)-modified liposomes: coupling of homing devices to the ends of the polymeric chains combines effective target binding with long circulation times". Biochimica et Biophysica Acta (BBA) - Biomembranes. 1149 (1): 180–184. doi:10.1016/0005-2736(93)90039-3. ^ Cevc, G (2004). "Lipid vesicles and other colloids as drug carriers on the skin". Advanced Drug Delivery Reviews. 56 (5): 675–711. doi:10.1016/j.addr.2003.10.028. PMID 15019752. ^ Karny, Avishai; Zinger, Assaf; Kajal, Ashima; Shainsky-Roitman, Janna; Schroeder, Avi (2018-05-17). "Therapeutic nanoparticles penetrate leaves and deliver nutrients to agricultural crops". Scientific Reports. 8 (1): 7589. Bibcode:2018NatSR...8.7589K. doi:10.1038/s41598-018-25197-y. ISSN 2045-2322. PMC 5958142. PMID 29773873. ^ Temming, Maria (2018-05-17). "Nanoparticles could help rescue malnourished crops". Science News. Retrieved 2018-05-18. Wikimedia Commons has media related to Liposomes.